Double Robotics hack from Niels Swinkels on Vimeo. The office where I work recently bought a Double Robotics telepresence robot. 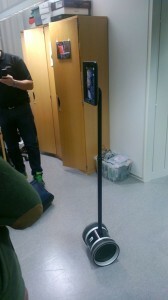 Imagine an iPad ontop of a Segway, and you will have a pretty good idea of how it looks and behaves. The fun thing of course is that you can start a video call to it. Your face will show up on the iPad, and you can see what the robot sees and tell it where to go. One thing that disappointed me a bit though was that only iPhones, iPads, or computers with the Chrome browser could be used to connect to the robot. I mean, why can I not do it from the Chrome browser on my Android phone? After a short dive into the source code of the Double Robotics webpage I figured out a way to make it possible, with a little bonus functionality in the end. If you have not done so already, go to http://drive.doublerobotics.com and log in with your account. Right-click somewhere on the page, and select View page source. If you do not see it in the menu, try right-clicking on a piece of text on the page. Or via the menu: Menu > Tools > View source (Ctrl+U) (Chrome). Here the drive number means how far you go forward (negative numbers) or backwards (positive numbers), and the turn means rotate right (negative numbers) or left (positive numbers). The default speed for going backwards is 50, and for making a turn is 100 or -100. Feel free to experiment with other numbers, but make sure you catch your robot if it falls! It seems that the numbers represent the amount of movement, and not the speed with which you move. Where 200 means move the pole up, -200 means down. Smaller numbers mean less movement. In this way you can position the pole at any height you want, not just all the way up or down. The only weird thing is that the robot might think that the pole has moved all the way up or down, and refuses to move more. To go around this you just move it once in the opposite direction, and then quickly a few times in the direction you want it to go. I’m lazy.. less typing please? 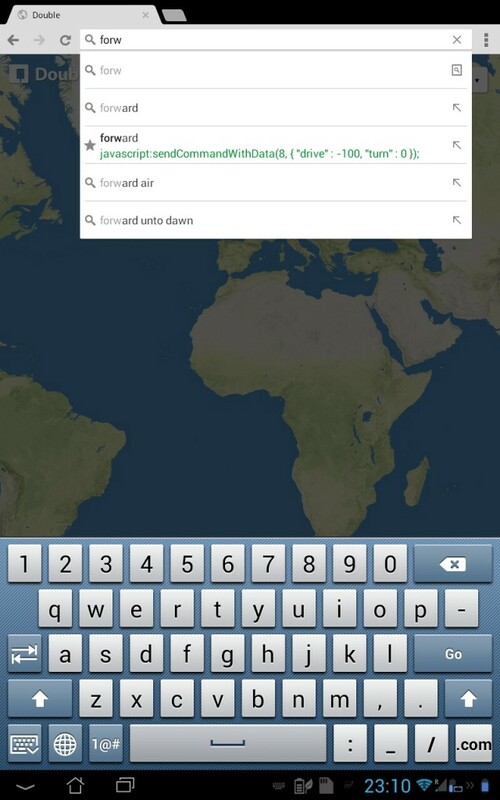 If you felt adventurous and tried this in the Chrome browser of an Android phone, you will have noticed that opening a bookmark via the menu does not work in this case. 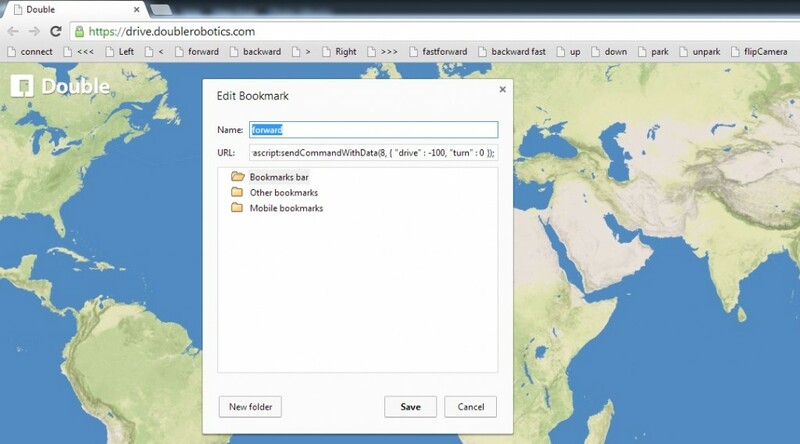 That is because as soon as you open the bookmark menu, you leave the Double Robotics webpage. The way around that problem is to start typing the name of your bookmark in the address bar, and click on it when you see it as a suggestion. There you can select what should be synced between devices. In our case we only need bookmarks. And at this point we can now connect to our robot, from an Android phone, even though Double Robotics tells us we can not. Just log in, and use the connectTo function. and appending four new buttons to it. With a little bit of Html knowledge and some experimentation you can change this code to create any shape of interface you want. Add this, as one long line, as bookmark to your browser. Then connect to your robot, and select the bookmark. Now you can steer your robot by just tilting your phone! Hold it upright to stand still. Tilt the top away from you to go forward, or towards you to go backwards. Tilt the screen to the left to turn left, and to the right to turn right. Enjoy! Note: Please drive carefully with your robot, and do not forget you have quite a delay in response time.